Think Before Buying The Famovape Magma UPDATE! I recently bought a Famovape Magma in the ocean deep color. Its a smaller dual 18650 mod with resin panels. There are a number of things I really like about it. Its really nice looking. The resin has a unique look with subtle small swirls of green and purple mixed with the blue and white. The resin also has a grippier feel than other resins. 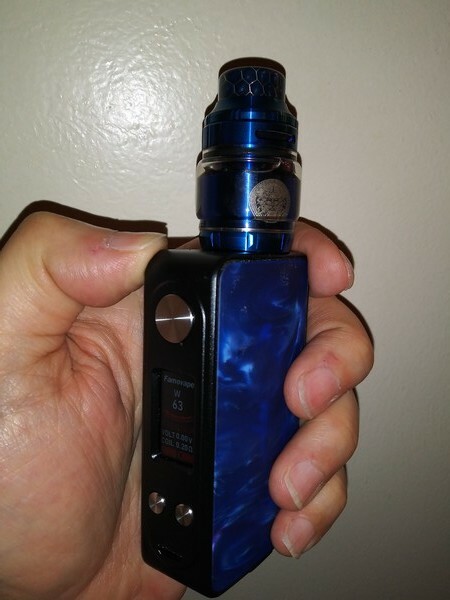 Its a very solid feeling mod with a metal frame and has a lot of weight for its size. It just feels good in the hand. The buttons are metal with a good clicky feel. The thing I like the most about it? Battery life. I get more strong hits from this device than any other. I am getting 225-250 draws from this whereas I would average about 150- 190 from other devices. I have no idea what to attribute this to other than a small screen and lack of functions. Its a very basic layout compared to most mods, but something in the chipset and or firmware make it very efficient. Now to the bad. Every time you change tanks or coils, it resets and then gives you its recommended wattage. If you don’t pay attention, you may end up burning your cotton. It has happened to me more than once. There is no way to turn it off as far as I can tell. Now to the really bad deal breaker part. The 510 is poorly made. Mine feels like there is not a spring but rather they rely on silicone or rubber for the spring effect. It reminds me of the 510 on the Hcigar Aurora squonk mod which also lacks a spring. I haven’t torn mine apart as it still works, so it may well have a spring, it just doesn’t feel like most 510s. I had to pry my 510 pin up once already because it wouldn’t rebound to make contact with the tank I installed. DJLsb also documented this on one of his review models and wouldn’t even give the mod a rating. Link below. Famovape responded in his comments saying they would resolve any issues before release to the public. Obviously they did not or used 510s that were just as bad. Its not the failing of my 510 that I am basing my opinion from but rather talking to the vape store employee I bought it from. They have sold about a dozen of the Magmas and half have come back due to the mods no longer recognizing any tank screwed on to them. Which sounds like a sunken 510 contact that won’t rebound. This is less than 2 weeks usage and a 50% failure rate. Its too bad because it has a few goods things going for it. The store already offered me a refund or exchange even though mine still works. I may replace the 510 or transfer the board to something else if the 510 completely fails. UPDATE: I removed the thumbs down. After talking to the same person, they received and sold out of a second shipment very quickly. None have been returned. He surmises that some of the first batch had the original defective designs. Two of the employees have them and haven’t experienced any problems as seen in the first batch. So it sounds like FamoVape did respond to criticisms, but some defective mods made it out in the first shipments. I still like mine and haven’t had any more problems. Thanks for the heads up Jim. What a shame they would release this with those problems. It is a shame as you said. I would happily buy something else with this chipset if it had a good 510. I hope Famovape does the right thing and makes it right for their customers and distributors that have to deal with failed products. It will make or break them, and they need to assure that their future products are improved. Now that’s a bummer, if I were you I take the refund they’ve offered. I have had other mods where the 510 got stuck a few times. I have pried them up gently and they continue to work, usually never getting stuck again. Probably not the case with this one, but I will keep using it until it fails. I kind of feel bad returning it while it still works and I really like the mod. Its not an expensive mod, so I wouldn’t feel bad tearing it apart and swapping out the 510. The store I bought it from has taken back mods from me that were far out of the warranty period so I am not too worried either way. Its one of the reasons I try to buy mods locally when possible. If I don’t take your advice, is there a spanking involved? If I don’t take your advice, is there a spanking involved? But I never said if I would enjoy it! See my update above. Although it doesn’t give me 100% confidence, it makes me feel better. I would probably buy a second one if they had a firmware update that could turn off the recommended wattage. Good to know, so all of vapordna is probably the updated version? Yep, you should be good buying from there.